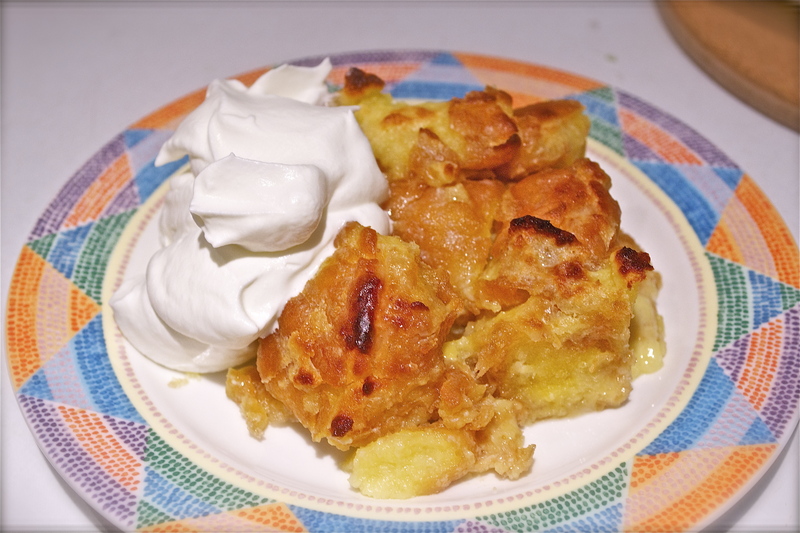 Donuts…baked in a bread pudding…forgive me arteries, for I have sinned. My sister talked me into this one, how I’m still not certain. I honestly thought she was joking…but then I had a bite, and wished I had never discovered this irresistible thing. I tried to push my plate away, but found myself going back for more against my own will. 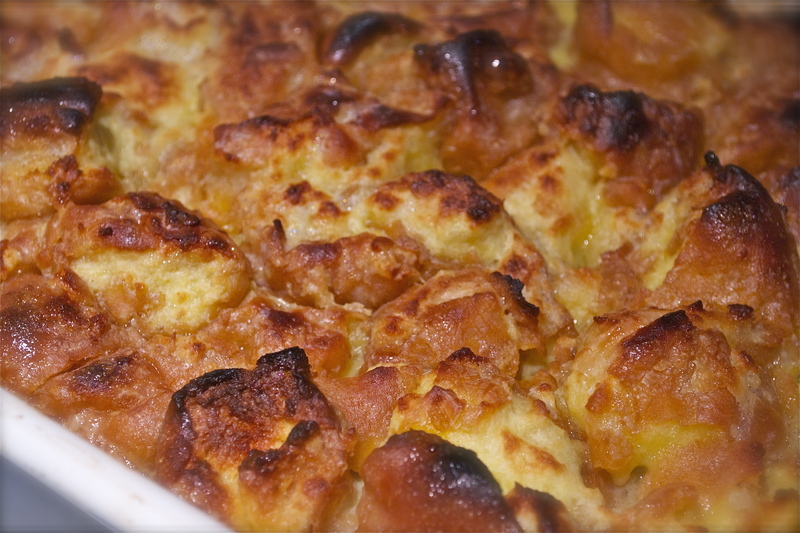 Sugary, golden goodness…save yourself while you can from this Krispy Kreme Bread Pudding. 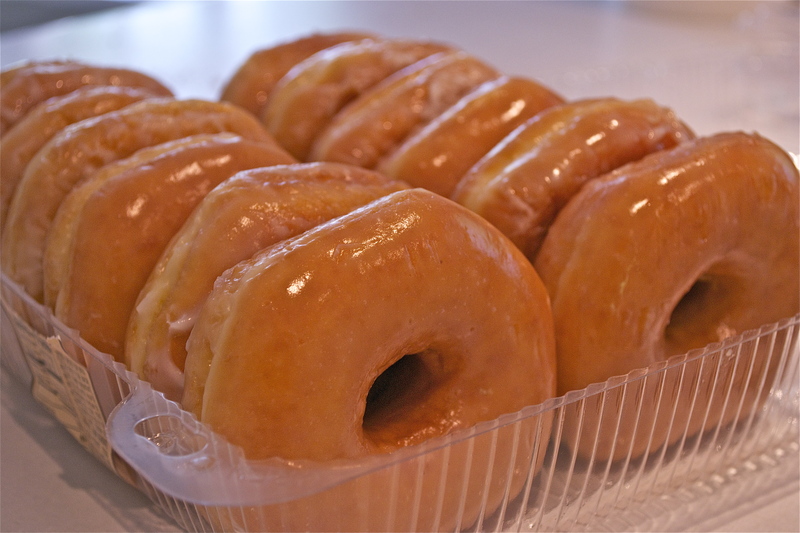 There’s something truly American about the doughnut (or “donut” as we like to spell it here). Evocative of classic diners and incomplete without a cup of coffee, they are seen as a cultural staple of the American breakfast. Though believed to be of Dutch origin, Hanson Gregory (an American) takes the credit for the ring shape we’ve all come to know and love. It is said he disliked the doughy, uncooked center of the pastries, and started using a tin can to cut the holes. Despite their integral connection to our culture, doughnuts are enjoyed across the globe, from the German Berliner to the Moroccan Sfenji. 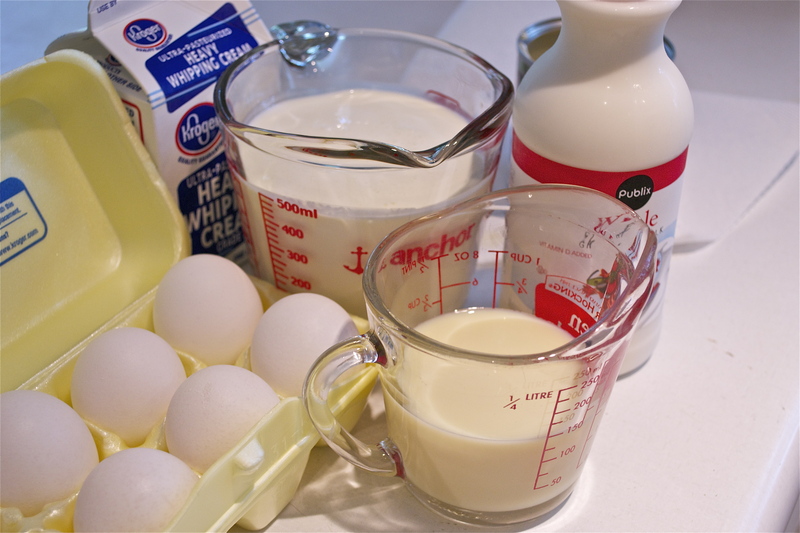 The custard for this dish is pretty dense, no lie – three types of cream and a dozen eggs – but crucial to turning this dessert from “just another pudding” to “you-can’t-put-the-fork-down” amazing! The trick is to toast the doughnut pieces completely, then allow them to sit at room temperature for a good 30 minutes or so before adding the custard. This helps give the pudding a sugary crunch. Regardless of the occasion, this dish will win over even the staunchest of critics (myself included): click HERE to see the recipe. This dish is so rich and eccentric, I couldn’t help but laugh when Sarah first told me about it. That led me to consider a musical pairing with such a sense of humor: Britten’s A Simple Symphony, for string orchestra. With movements titled “Boisterous Bourrée,” “Playful Pizzicato,” “Sentimental Saraband,” and “Frolicsome Finale”, he’s made known the humorous intent. That being said, each movement does ring true to it’s name. The work opens on a lively note, giving us hints of classical norms which are then offset with not-so-subtle antics. It then glides into a dazzling second movement simmering with a restrained energy, played entirely without bows. The third movement is the longest, taking a reflective turn into a more emotive realm. The fourth movement then “snaps us back to reality,” giving a festive closure to this delightful “morsel” of a work that runs just under 20 minutes. The recording below is with the Orpheus Chamber Orchestra – enjoy!